Since our meeting I’ve been a big supporter of all things HipGnosis. Although I don’t get to listen as much as I’d like, I follow a lot of his work on his SoundCloud artist page, on Facebook, and of course on Twitter. People who follow him or The Magical Buffet on Twitter will see fairly regular exchanges between us doing the Twitter equivalent of the drunken “I love you man” that is better known among Twitterers as “Follow Friday”. 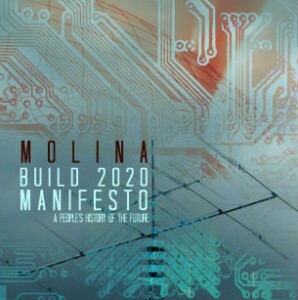 Inspired by futurists like Ray Kurzweil — who famously theorized that the 21st century would bring the equivalent of 20,000 years of technological progress — Molina created “Build 2020 Manifesto” in the hopes of creating a new movement of social progressives who will seize the power of technology to create a better world for everyone. His concern is that, left unchecked and unguided by conscientious humans, the rapid pace of change will have dire social, political, economic and environmental ramifications. HipGnosis comes from the world of experimental electronic music. His interest in psychoacoustics (the effects that certain sounds have on the brain) and technology, coupled with his passion for social justice and grassroots movements, made him an ideal collaborator. His contributions to “Build 2020 Manifesto” create an ominous, glitchy and futuristic mood that are an apt complement to Molina’s words. FYI, the cover art for “Build 2020 Manifesto” is by Dustin Neal and I totally snatched the image from the Reverb site.